Swimming pool renovations and new pool installations in Australia are certainly on the rise. With the average price for a renovation being around $25,000 – $35,000 compared to a new pool installation of between $70,000 – $110,000. Non slip natural stone pavers sales, when paving around a swimming pool are up around 100% year on year. Below are images of suitable natural stone pool pavers and pool edge coping on fibreglass and concrete pools. If you are after more information on pool paving and coping tiles please call us on (03) 9706 9767. Harkaway Bluestone pavers and 40mm drop face edge pool coping. Harkaway Bluestone 40mm drop face pool coping pavers. Himalayan Honed Sandstone bullnose pool coping and matching pool pavers. Teakwood Sandstone pool pavers with 30mm bullnosed pool coping matching pavers. simply click HERE to view our entire range of pool coping for salt water or chlorinated swimming pools. This swimming pool in Sydney has HIMALAYAN SANDSTONE PAVERS in the paver size of 500x500x15mm with a natural split surface. 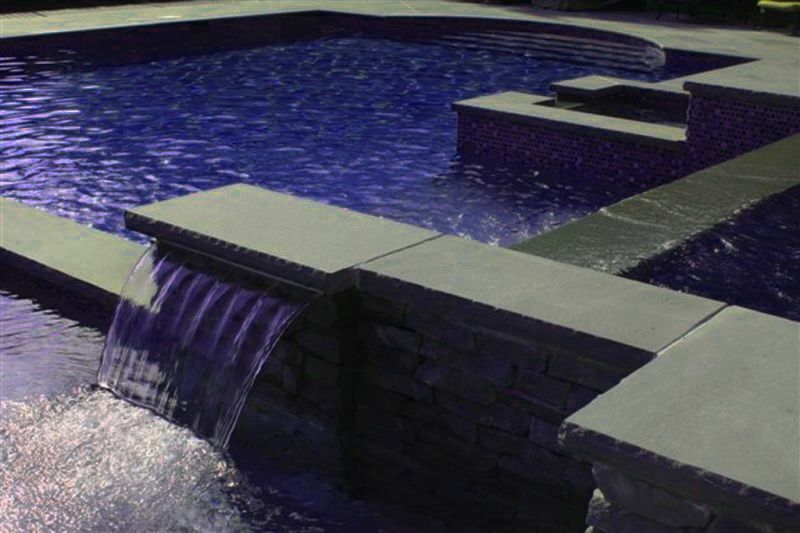 The pool coping is HIMALAYAN SANDSTONE PAVERS with a honed surface finish. TEAKWOOD SANDSTONE pool pavers along with matching bullnosed pool coping tiles were installed around this swimming pool on the Sunshine Coast. A variety of pool coping and pool pavers used to surround various swimming pools. See all our pool coping and pool pavers. Bluestone pool coping tiles surrounding abstract pool. See more bluestone here.